If you stare at the Pink and White Zebra Stripes on the shutters of Jane Coslick's latest renovation, a pink zebra may appear. So they say, and who knows, because you are on Tybee where the ocean fixes everything. Walk into this charming haven and leave your everyday cares behind?because who can be stressed in a cottage decorated in colors like Beach House Blue, Tybee Turquoise, Beach Bucket Red, Key Lime Parrott, Luscious Little Cottage Pink, and Anna Banana Yellow? The white board ceilings and walls make Jane's signature colors pop and, as usual, the art and accessories are simple and unique. Five steps up from the white rock driveway, you'll enter the main cottage's living/dining/kitchen area with a large screen TV. The slip covered, comfy furniture, a round table with four chairs and a bar with 4 stools are easy care and fun. Say hello to the zebra standing on the refrigerator. The three king bedrooms are colorful and clutter free, and there are two full baths with showers. There is a set of bunk beds in one of the king rooms as well. A small screened-in porch looks over the pool in the backyard. The garage apartment (12 steps and a separate entrance) has two rooms, a full bath and a small screened in porch. The first room has a futon that will sleep two and a kitchen sink, red microwave and a Coca-Cola mini refrigerator. What fun! The back room has two twin beds. There is a full bath with shower, and a small screened porch. This is a perfect beach getaway, because nothing is very far away, yet you are in a soul-soothing cottage on a quiet street with trees. It's calling your name. The Pink Zebra Cottage is available for winter monthly rentals from December 1st, 2018 until March 13th, 2019. Please call for rates. "The Zebra Cottage is a great place to spend a relaxing vacation. The house is vintage yes but very well maintained and very clean. Location to the beach is good and pool is a huge bonus. Certainly not the fanciest house on the island but very comfortable. Tybee Island is an interesting place with lots of history. Savanah is well worth the visit, our family spent more than one day walking the streets there. We recommend this location with 4 stars." "The location of this cottage was perfect! We could walk across the street to the quiet beach but we did not even need to leave the house because of the in ground pool. Every thing was comfortable and so cute. Three king size bedrooms accommodated all of our group. The furniture was comfortable. We enjoyed the screened in porch. The garage apartment was comfortable. The only drawback was the TV in the den area did not work because the cable box was defective and the replacement did not arrive before the end of our weekend. But I would definitely stay at this home again. " "This was a perfect cottage for the six of us on a sisters weekend. The location is very convenient to the beach and everything was in good shape in the house." "This cottage was perfect in every way. Our family of 10 had a fantastic stay at the Pink Zebra. We definitely will return! " "There was plenty of room for me, my boys and 2 nieces, plus my BFF, her husband and son stayed in the mini apartment above the garage, which allowed them some nice private time. The pool was fab! My only complaint was that the amount of dish and drink ware, as well as cooking vessels, was a little slim for a place which is marketed suitable for 10-11 guests. That aside, it was another fantastic Tybee memory!" "We thoroughly enjoyed our stay in the Pink Zebra Cottage. The house has a nice old style beach house charm though it has been nicely updated. We were only 4 staying there so we had lots of room. The kitchen may be a bit small for larger crowds but served us well. We did have issues with the DirecTV reception and the WiFi was spotty at best, but we figured we were on vacation and could use some disconnecting for the week. Great location, super easy walk to the beach. We will be back as soon as possible!" "This was the 2nd time my family stayed at the Pink Zebra Cottage. The location is very close to the beach and it is also within walking distance to many great restaurants. The main house, pool, and guest quarters were very neat and clean. Jim was awesome to work with. I definitely recommend this rental! " "Our group rents cottages from Jim and the team from Tybee Cottages every year. Tybee Cottages has always been great to work with and as flexible as they can be for our needs. The properties are always clean and in great shape. " "Wonderful cottage that was very clean, comfortable and cozy for 8 guests. The little cottage is very nice and perfect for a little secluded spot. Jim was extremely responsive and helpful. The house itself was wonderful and extremely comfortable. The beds, bathrooms and kitchen were perfect for our weekend. The location is great, it's walking distance to the beach across the street! The details were fantasticour only qualm was that we didn't have enough toilet paper and trash bags. Other than that this place was perfectly appointed for a weekend getaway. "The zebra cottage is the perfect place to 'get away'. It is beautifully renovated and has everything a family could need. The separate garage apartment is especially nice for travel with teens." "We had a group of nine staying at the cottage. It worked out great for us. The beds were great - very comfortable. The beach is close by but honestly we preferred being in the pool. Our family is already talking about going back next year. " "After a condo canceled on my family the week we were scheduled to arrive, I feared family vacation would be canceled. They worked with me to book the cottage last minute. They were very genuine, calm and kind making a stress situation better. The house was great for my multi generation family. Clean, close to beach. They came out right away to clean pool after storm. " "We enjoyed another wonderful week on Tybee. We loved the space the home provided. Love the cozy home and lounging by the pool. The garage apartment was great for twin boys to hangout. One suggestion would be to add a handrail to make it easier for all ages to enjoy the pool easier... steps can be a little tricky. " "We couldn't be more pleased with our third stay at Mo's Pink Zebra Cottage! It is lovely, well-furnished, and worked well with our group. We enjoyed the pool and the short walk to the beach was quite doable even for small ones. As usual, the property was clean and in order and the management company very accommodating to our every need." "Great experience from initial contact thru entire stay. Cottage is even cuter than pictures! Nicely appointed, very short walk to the beach. Quiet neighborhood but close to everything. Plenty of room for our large group. Thank you for a wonderful experience!" "Great place for our family to come together. The house was great! Kitchen is small, but doable. Beach access was across a busy road." "Great as usual. Second time in this house, 5th time in a Tybee Cottage. We will be back and wish the Pink Zebra house was out own (as well as Southern Tides!)." "I grew up on Tybee in my early childhood and then moved to Atlanta. I LOVE sharing "my beach" with my 4 kids every year I can. I always want everything to be perfect. Mo's was perfect. I love vintage and the house was adorable inside and out. We had plenty of space with the attached cottage,there was 7 of us. The location was excellent. I walked to the YMCA in 3 mins to workout and it was a 5 minute walk to the beach. To top it off, Jim was the best! He felt like family, so easy to work with! See ya next year Mo's!" "Enjoyed a wonderful Girl's Trip at Mo's Pink Zebra. Convenient access to the beach. Small pool for when you don't feel like the beach but would be better if pool was accessible from porch. Bike path located on the street behind the house. Bring a can opener and wine key as those are not provided. 3 king beds make for plenty of sleeping area and rooms are spacious. The attached loft is awesome for those who need a space to themselves. Overall a great stay in a unique house!!" "the house was great!! tybee is great!! i would give jim (manager) 10 stars!!" 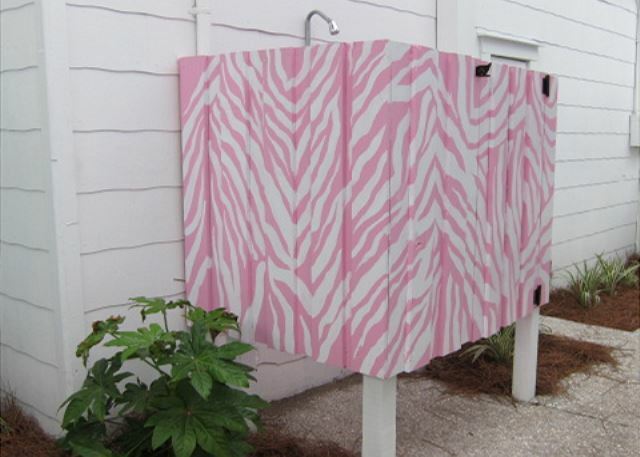 "The Pink Zebra Cottage was perfect for our friend's bachelorette weekend. It was a close walk to the beach and a short car ride or island hopper ride to the restaurants and bars to the south part of the island. The house was spacious enough to sleep all 10 of us and just the right amount of sitting room. The decor and the updates to the house were done perfectly. Jim was very easy to communicate with and was gracious enough to let us check in a little early. We had only 2 complaints about the house. One being that we had to put a net to the pool to clean ourselves (I don't think it had been done before we got there) and we definitely made good use of the pool! The other complaint was that there was no mirror in the guesthouse at all which we thought was odd. But overall, we had a wonderful stay and did not want to leave the Zebra cottage! Thank you Jim!" "We had an awesome visit to the property. So tastefully decorated, the kitchen was just perfect with great supplies & appliances. Our family throughly enjoyed the pool. The beds slept wonderfully, and the hardwood floors are beautiful. The room over the garage was great for 'quiet time' when needed. We look forward to visiting again!" "Our family rented this cottage along with two other properties close by for a multi-family reunion week. Mo's Pink Zebra cottage made a great place to meet up for dinners and pool time. All of the beds were comfortable and the house had fun, beachy decor. It was a short distance to walk to the beach. We loved it and would rent it again." "Mo's Pink Zebra was comfortable and in a great location. We ussually rent larger houses for our family vacation but this worked very well with the separate living area above garage and the pool. It's just two blocks from beach and by the bike route. We hope to return soon. Thanks for making your sweet cottage availible to us! " "We shared the cottage for the week with 6 adults and 4 children. This cottage is beautifully decorated with a great pool and very close to the beach. The rental company was excellent as well. We love this island and hope to return to the is cottage in the near future! " "This cottage is so much fun! The location is perfect if you like to avoid the crowds and the noise at night on the south end of the island. There is a short walk to the beach, and a great playground is close by. There is a fabulous guest house that would be perfect for a babysitter. Everything about the Pink Zebra Cottage is very nice and totally adorable down to the turquoise appliances. Loved it!" "I rented Pink Zebra for my mom for her birthday weekend, and what a great time we had! The location is perfect, is fact you can see the boardwalk to the beach from dinner table. The design of the house is spectacular and makes you feel relaxed and just so happy. My personal favorite was the guest house, it is right next to the pool and the cute little bedding area was perfect for reading on some of the rainy days we experienced. It was also very very clean, and felt like I was right at home. Jim of Tybed Cottages was also very helpful in helping us through the rental process. Perfect stay! " "Jim is always quick to respond to questions about availability and the properties. The property exceeded expectations, and was perfect for a long weekend. "